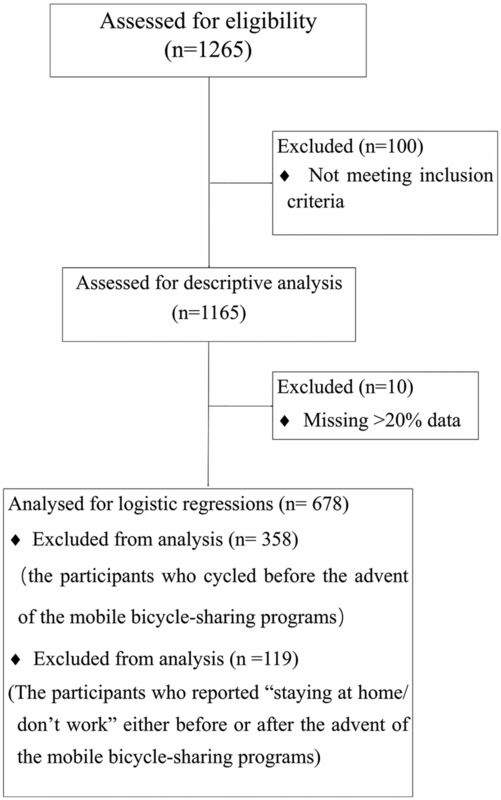 Objectives To examine (1) the effect of new dock-less bicycle-sharing programmes on change in travel mode and (2) the correlates of change in travel mode. Design A retrospective natural experimental study. Setting 12 neighbourhoods in Shanghai. Participants 1265 respondents were recruited for a retrospective study in May 2017. Main outcome measures Prevalence of cycling before and after launch of dock-less bicycle-sharing programme. Results The proportion of participants cycling for transport increased from 33.3% prior to the launch of the bicycle-sharing programmes to 48.3% 1 year after the launch (p<0.001). Being in the age group of 30–49 years (OR 2.28; 95% CI 1.30 to 4.00), living within the inner ring of the city (OR 2.27; 95% CI 1.22 to 4.26), having dedicated bicycle lanes (OR 1.37, 95% CI 1.12 to 1.68) and perceiving riding shared bicycles as fashionable (OR 1.46, 95% CI 1.21 to 1.76) were positively associated with adopting cycling for transport. Access to a public transportation stop/station (OR 0.82, 95% CI 0.67 to 0.99) was inversely correlated with adopting cycling for transport. Conclusions Dock-less bicycle sharing may promote bicycle use in a metropolitan setting. Findings from this study also highlight the importance of cycling-friendly built environments and cultural norms as facilitators of adopting cycling. An ecological framework can guide inquiry into a more comprehensive understanding of the factors that influence cycling behaviours. This study is the first to quantitatively evaluate whether the introduction of dock-less bicycle-sharing programmes leads to more cycling. All measures were based on self-reports. This study applied a retrospective design, due to practical reasons outlined earlier. This limits causal inference from the current study. It could not verify whether the significant change from inactive transport modes to cycling has increased physical activity at the population level. Furthermore, the introduction of bicycle-sharing schemes alone may not lead to population-level uptake, as various other factors may need to be present to facilitate population-level cycling. In line with socioecological models, previous research suggests that population-level cycling behaviour is associated with a range of individual-level and environmental-level characteristics.26–29 However, these socioecological correlates have rarely been examined in evaluations of PBSPs and remain important research gaps. Therefore, this study aims to (1) evaluate whether the introduction of dock-less PBSPs leads to more cycling and (2) to examine correlates of initiation of cycling, including sociodemographic characteristics and aspects of the built and social environment. A retrospective study was conducted in May 2017. An intercept convenience sample survey was conducted among residents from 12 neighbourhoods. On approaching potential participants, information about the study was provided and written informed consent was obtained before participating in the study. Participants have the right to find out the results of the study by contacting the member of the project. Dock-less bicycle-sharing systems can be considered as a city-level intervention for travel mode. The system was officially launched in Shanghai in April 2016. By July 2017, there were more than 13 million registered users and more than 1 million dock-less shared bicycles in Shanghai.30 The development of dock-less shared bicycles was so rapid in China that it limited opportunities for prospective data collection or inclusion of a control city that is comparable to Shanghai, but without a bicycle-sharing system. Therefore, a retrospective study design was used. To explore the correlates of travel mode, a two-stage sampling method was employed. First, based on the Shanghai Transportation Map, the city was divided into four areas: within the inner ring, between the inner and middle rings, between the middle and outer rings, and beyond the outer ring. Then, three neighbourhoods were selected in each of the four areas of Shanghai by purposive sampling. The selection criteria for neighbourhoods were as follows: (1) within 1–2 km distance from the nearest subway station; (2) the number of residents within the neighbourhood was more than 1000. Within each selected neighbourhood, trained interviewers conducted at least 100 self-administered intercept surveys in May 2017. The inclusion criteria for participants were (1) being 18–70 years old; (2) having lived in the selected neighbourhood for more than 3 months and (3) being physically capable of riding a bicycle. Altogether, 1265 respondents were sampled from 12 neighbourhoods. After excluding 100 respondents with more than 20% missing data, 1165 respondents (92.1%) remained in the analysis. Travel mode before and after the advent of the dock-less PBSPs was assessed by asking respondents two questions: (1) How did you travel most of the time before the advent of dock-less PBSPs? (2) How have you been travelling most of the time after the advent of dock-less PBSPs? Respondents selected one of the following options, including walking, cycling, by car, public transport (subway, bus, ferry and shuttle bus), motorcycles/electric motorcycles, combined public transport with walking (>500 m), combined public transport with cycling, do not travel (staying at home) and other. According to respondents’ travel mode before and after the advent of dock-less PBSPs, they were classified into cyclists and non-cyclists at both time points. Cyclists were defined as participants who travelled by bicycle or those who combined cycling and public transport most of the time. To date, only few instruments have been developed to measure perceived bicycle-friendliness of neighbourhood environments and most of these were developed for the physical environments of Western countries.31 A new scale for measuring Chinese neighbourhood bikeability was developed based on existing instruments, literature reviews, field visits and expert consultation. Specifically, we adopted five questions (ie, distance to a public transportation stop/station, access to destinations, physical condition of bicycle lanes, maintenance of lanes and vegetation/shade along the bicycle lanes) from the Chinese Walkable Environment Scale for urban community residents.32 Based on consultation with several Chinese local PA experts to discuss potential correlates and determinants of cycling, we added four questions to the survey, including the presence of dedicated bicycle lanes, and the degree to which traffic violations, traffic volume and motorbikes/electric scooters impede cycling. Finally, this instrument was pilot tested and adjusted prior to the survey. All bikeability variables were on a 5-point scale and the composite score was analysed as a continuous variable. More details about the questions are provided in online supplementary appendix 1. Two survey items assessed social norms: ‘Riding dock-less shared bicycles is fashionable’ and ‘Riding dock-less shared bicycles represents low socioeconomic status’. Each item was rated on a 5-point scale, from 1 (strongly disagree) to 5 (strongly agree). Self-reported sociodemographic variables included gender, age, education, personal monthly income and marital status. Age was categorised as <30, 30–49 and ≥50 years. Educational attainment was categorised as ≤junior high school, high school/technical secondary school, junior college, and university and higher. Monthly income was categorised as <¥2000, ¥2000–¥4999, ¥5000–¥9999 and ≧¥10 000 (¥1=US$0.15 in May 2017). In addition, questions about motor vehicle and bicycle ownership and characteristics of the commute were asked, including the following: (1) what is the distance between your home and work/college/university and (2) how long does it take you to go to work/college/university every day, both of which were converted to categorical variables. McNemar’s test was used to examine the change in travel mode after the introduction of the dock-less PBSPs. To explore the potential correlates of change in travel mode, we focused on the participants who did not cycle before the bicycle sharing became available and classified them as those who (1) changed from not cycling to cycling and (2) remained not cycling as their travel mode. More details can be found in figure 1. Because the data were hierarchical in nature (individuals clustered within neighbourhoods), we explored multilevel modelling. However, on examination of the outcome variable, we decided against multilevel modelling because the intraclass correlation coefficient was 0.0645 and we only found a significant random effect in 1 out of 12 neighbourhoods. Therefore, logistic regression was conducted to examine the association of sociodemographic variables, perceived bikeability and social norms with change in cycling behaviour. Sequential modelling was used with model 1 including only sociodemographic variables, model 2 including sociodemographic and bikeability variables and model 3 additionally including social norms. Statistical analysis was performed using the SPSS V.20.0 (SPSS) and the significance level was set at 0.05. The demographic characteristics of the study sample are reported in table 1. The final sample consisted of 1165 participants from 12 neighbourhoods. Nearly 40% of the participants were 30–49 years old, and over 75% were married. More than 40% reported an income level between ¥2000 and ¥4999/month. Over 75% of the participants owned bicycles, while nearly half of the participants had motor vehicles. The average distance from work/college/university was 5.6 km, while the average commuting time was 26.6 min. Before the launch of the dock-less PBSPs, 33.3% of the participants cycled for transport which increased significantly to 48.3% after the launch (p<0.001). Among the participants who usually travelled by car/motorcycles/electric motorcycles, walking/walking combined with public transport and public transport before the launch of the dock-less PBSPs, there were 115 (28.4%), 50 (28.2%) and 28 (29.2%) participants who adopted cycling as their primary travel mode after the launch, respectively. As shown in table 2, in model 1, among 645 participants who did not report cycling commuting cycling at baseline, those who were <30 and 30–49 years old had more than twice the odds of adopting commuting cycling than participants who were 50 and older. Participants who lived within the inner ring had more than twice the odds to adopt cycling compared with those who lived in the area between the inner and middle rings. Participants living >5 km from work/college/university had more than twice the odds of initiating cycling compared with those living within 1.5 km from work/college/university. In model 2, presence of dedicated bicycle lanes was positively associated with adopting cycling. Model 3 showed that participants who owned motor vehicles were more likely to adopt cycling than those without motor vehicles. In model 3, access to a public transportation stop/station was inversely associated with adopting cycling, and perceiving riding dock-less shared bicycles as fashionable was positively correlated with adopting cycling. The perception that riding dock-less shared bicycles represents low socioeconomic status was inversely correlated with adopting cycling. This is the first community-based study to evaluate the effect of new dock-less PBSPs on cycling for transport. Over the last 30 years, China has witnessed rapid economic development and a booming car industry and consequentially, a dramatic decrease in cycling.12–14 With the introduction of dock-less PBSPs, we found that the proportion of participants that cycled for transport increased significantly from 33.3% to 48.3%. To date, few studies have examined correlates of adopting cycling in the context of newly introduced PBSPs. With the rapid development and popularity of dock-less PBSPs, it is necessary to examine potential correlates of adopting commuting cycling. We found that younger participants were more likely to adopt cycling, which is consistent with previous studies.46–48 Gender and education were not related to adopting cycling, which is consistent with a study conducted in Beijing, but different to results from other studies from the USA, Spain and the UK which found that males and those with higher education were more likely to cycle.28 47–49 Previous evidence on the associations between income and cycling was mixed, and our findings suggest no association between income and change in travel mode.27 28 47 50 It is noteworthy that we found positive associations of commuting distance and car ownership with adopting cycling, which is counterintuitive and different from previous findings.47–49 51 A potential explanation is that those who lived within walking distance (<1.5 km) to work/college/university may not own a car or have considered cycling, so bicycle sharing was most likely to affect those who lived relatively far away from work/college/university and previously travelled by car because they could not easily access public transportation stops/stations without shared bicycles. Another finding from our study relates to social norms. Although previous studies have found effects of attitudes towards cycling and other modes of transportation on mode choice, our study examined effects of both positive and negative attitudes towards cycling.56–59 Our data showed that the perception that riding dock-less shared bicycles is fashionable was positively correlated with adopting cycling while considering riding dock-less shared bicycles representing low income was inversely correlated with switching to cycling. This finding highlights that promoting positive social norms may be critical to increasing cycling at the population level. There are some limitations to this study. First, all measures were based on self-report, however, the measures have been validated.32 Second, this study applied a retrospective design due to practical reasons outlined earlier. This limits causal inference from the current study. Third, because we did not collect total PA levels at two time points, we could not determine whether those who have adopted cycling have become more physically active overall. We found that dock-less bicycle sharing can be effective in increasing bicycle use and might have the potential to be scaled up internationally. To maximise the impact of dock-less PBSPs at the population level, improving attributes of the built environment, such as dedicated bicycle lanes, and promoting positive social norms about cycling should be considered. The rapid development and popularity of dock-less PBSPs provides new opportunities for active travel, but also poses challenges for their management. Operators of dock-less PBSPs and local governments should work together to create better built environment and social norms for promoting active travel and PA.
We would like to express our sincere thanks all participants for their time and the community organisers from 12 neighborhoods who provided assistance during the field investigation.
. The impact of urban policy on the development of bicycles and cycling in Shanghai, in Urban and rural governance and planning reform - 2014 annual meeting of China’s urban planning. Haikou, Hainan, China.
. Analysis on the changing trends of transportation modes and time among Chinese non-agricultural professional population in 2002 and 2010-2012. Acta Nutrimenta Sinica 2017;4:327–31.
. Bike-sharing: history, impacts, models of provision, and future. Journal of Public Transportation 2014;12.
. Bikesharing in Europe, the Americas, and Asia: past, present, and future. Transportation Research Record 2010;2143:159–67.
. Study on the behavioral influencing factors of the choice of the public bicycle users in Jinhua. Business 2016;16:62–3.
. Analysis on the current situation and countermeasures of the use of public bicycles in Xi’an. China Market 2016;32:180–1.
. Mobile bicycle-sharing: the new favorite travel mode-Sina website. http://finance.sina.com.cn/roll/2016-12-06/doc-ifxyiayq2548321.shtml (Accessed 12 Dec 2017). Ministry of Transport of the People’s Republic of China: a total of 10 million mobile shared bicycles had been deployed in China and overdose in some areas-Cankaoxiaoxi website. http://www.cankaoxiaoxi.com/china/20170523/2030603.shtml (Accessed 25 Sep 2017).
. Additional shared bicycles are banned in Shanghai; there are over 1.5 million mobile shared bicycles-Guangming website. http://politics.gmw.cn/2017-08/20/content_25733044.htm (Accessed 26 Sep 2017). Mobike. Bike-sharing and the city - 2017 White Paper. Shanghai: Mobike, 2017.
. Ecological models of health behavior. In: Glanz K , Rimer BK , Viswanath K , eds. Health behavior and health education: theory, research and practice. 4th edn. San Francisco: Jossey-Bass, 2015:43–64.
. There are more than 1 million mobile shared bicycles and more than 13 million registered users in Shanghai:Eastday website. http://sh.eastday.com/m/20170614/u1a13043063.html (Accessed 26 May 2017).
. Evaluation on reliability and validity of the Chinese walkable environment scale for urban community residents. Chinese Journal of Public Health 2011;07:841–3.
. Bike-sharing systems in Beijing, Shanghai and Hangzhou and their impact on travel behaviour. Transportation Research Board Annual Meeting. Washington, DC, 2011.
. Travel behavior change after the introduction of public bicycle systems: a case study of Minhang District, Shanghai. Urban Planning Forum 2012;05:76–81. China Internet Network Information Center. China’s 39th statistical report on internet development. In: Official statistics for internet development, 2016.
. A study on urban bicycle transportation system: Southwest Transportation University, 2004:9.
. A study on the development of urban mobile bicycle-sharing based on shared economy. City 2017;03:66–9. Bike share in the U.S. NACTO Bikesharing Annual Report (2010-2017) Summary. 2017 https://nacto.org/bike-share-statistics-2017/.
. In: Chakroborty P , Reddy HK , Amekudzi A , eds. Effect of bicycle friendly roadway infrastructure on bicycling activities in urban India, in Procedia - Social and Behavioral Sciences. 104, 2013:1139–48.
. The impact of organizational culture on bicycle commuting frequency: the research based on example of three IT companies, in Springer Proceedings in Business and Economics. 2016:201–10.
. Bikesharing and bicycle safety. San Jose, CA: Mineta Transportation Institute, 2016.
. A multi-phase QFD-based hybrid fuzzy MCDM approach for performance evaluation: a case of smart bike-sharing programs in Changsha. J Clean Prod 2018;171:1068–83.
. An integrated approach for failure mode and effects analysis based on fuzzy best-worst, relative entropy, and VIKOR methods. Appl Soft Comput 2018;72:636–46.
. Planning for shared mobility: American Planning Association, 2016. DD and HF contributed equally. Contributors YJ and HF conceived the idea, analysed the data and drafted the paper. DD, KG, LC, SZ and ZM contributed to the writing and assisted with the analysis and interpretation. YJ, LC, SZ and ZM contributed to collecting the data. All authors have read and approved the final manuscript. Funding The work was supported by the Shanghai Municipal Commission of Health and Family Planning (Grant No. 15GWZK1001 and 2013SY006). Ethics approval This study received approval from the ethics committee of the School of Public Health of Fudan University, China (IRB00002408 and FWA0002399). Data sharing statement Please contact authors for data requests.